Here's how the authors of this website looks like!! Hi I'm George. I am a musician playing in a band since 1993. I am a keyboard player presently playing with the band called "Time & a Half" performing in different parts of the Philippines. I started playing the piano when I was 9 years old. And then joined my very first band when I was in highschool. I started performing internationally in 1993 with the band called "First Option". We performed in Australia and some parts of the Middle East. It lasted for 3 years. And then after that I decided to formed my own band which I named "Fine Bricks", we performed in Hanoi, Vietnam and in the Philippines for 2 years and after that I formed another one named "SCAMBAGS" it only lasted for a year. Ghio and Bette. 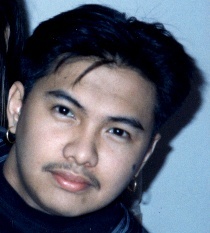 This was taken in 1995 when we were in Bahrain, performing at Diplomat Hotel. Hi! This is the other author of this site. Well, I was in a band since 1990. Performing around the globe for 9 years. My first band was called "Long distance". I was with them for 4 years performing in a five star hotels in Manila, Philippines and performing in Asia. And after that I joined another band "Prestige" which only lasted for 8 months and after that joined the "First Option" in 1995. When we disbanded in 1996, Ghio and I decided to formed our own band which we named "Fine Bricks" and "SCAMBAGS". You might be wonderin' where we got our name "SCAMBAGS". Well, we'll tell you all about it as we go along. When we were in Dubai, U.A.E in 1996.